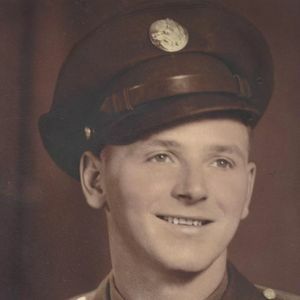 CENTRAL CITY - George William Keiser, 95, of Central City, died Monday, January 30, 2017, at 4:18PM at Owensboro Health Muhlenberg Community Hospital. Mr. Keiser was born December 17, 1921, in Muhlenberg County. He worked at Owensboro Forging Co. for 16 years. He was a machinist and foreman at Smith Brothers Machine Co. in Owensboro for 41 years where he finally retired at the age of 76. George enjoyed hunting and the outdoors, good friends and gospel music, UK basketball, old cowboy movies, and a good hamburger and Coca-Cola. He was a member of Third Baptist Church in Owensboro, and was a World War II veteran, serving in the U.S. Army. He was preceded in death by his parents, Elsie Irene Gunn Keiser and Herman Joseph Keiser; sister Omerjean Clark; first wife Laura Blandford; second wife Carrie Long; and brother Herman Elden Keiser. Survivors include his adopted family, Terry, Glenda, and Sara Schmautz; and many friends in Muhlenberg County. Funeral services will be Wednesday, February 1, 2017, at 2:00PM at Tucker Funeral Home in Central City, with Rev. Robert Lindsey officiating. Entombment in Rose Hill Cemetery in Owensboro. Visitation will be Wednesday after 11:00AM at the funeral home. Expressions of sympathy may take the form of contributions to Muhlenberg County Humane Society, P.O. Box 164, Greenville, KY 42345. Envelopes will be available at the funeral home. Online condolences may be made at www.tuckerfuneralhomes.com. He was my mentor in the machine shop business right after I got out of active duty military, and still in the reserve. I taught me a lot, and was very patient. Rest in peace George, and thanks. We were saddened to hear of Mr. George's passing. As requested, we have made monetary donation in his honor, to the Muhlenberg Humane Society. May he rest in God's arms..He will be missed.